For philosophy alum Will Sanders, attending the University of Kentucky was always part of the plan. The Frankfort native’s parents both attended the university and it was natural for him to follow in their steps. Choosing a major was the challenge. The College of Arts and Sciences was the perfect place to land when it came to finding his footing, according to Sanders. Sanders said he was drawn to Eastern philosophy in part because of his interest in the “beats,” a group of American writers who were popular in the 1950s and known, among other things, for their rejection of materialism and interest in Eastern religions. A student in the UK’s Honors Program, Sanders said he often drew on his philosophical interests in class discussions and in journal projects. "Philosophy wasn’t what I set out to major in initially but my interests led me in that direction,” he said. Sanders discovered limitless support and resources in the faculty of the philosophy department, even beyond the confines of typical coursework. For his Gaines Fellowship thesis, Sanders worked under the close supervision of three of the department’s faculty: Alan Perreiah, Ron Bruzina and David Bradshaw. The fellowship, created by the Gaines Center for the Humanities, promotes the integration of the humanities into other university studies and allows its fellows to participate in special lecture series, discussion groups, and other assorted projects. For his thesis, Sanders critically examined the term “mysticism” and its application to pre-modern Zen Buddhism. Sanders received the Clay Lancaster Scholarship from the Warwick Foundation, which allowed him to use the reference library and facilities at the Warwick estate while working on his Gaines thesis. In addition to his work through Gaines, Sanders also completed an independent study on Martin Heidegger, a German philosopher who was engaged with Asian philosophy. Sanders has continued on the path he first found while at UK. 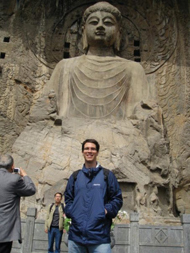 Immediately after graduating in 2008, Sanders spent two months at a Buddhist monastery in Taiwan as part of the Woodenfish Program. While there, he lived as a monastic while taking academic classes on Buddhism and participating in religious practices. He then spent 10 months at Peking University in Beijing where he studied Mandarin and Classical Chinese. 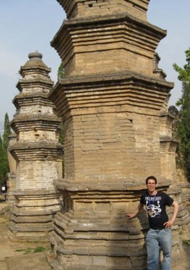 He used the language skills acquired there to visit a number of religious sites and interview Chinese monks and nuns. He is currently working on a master’s degree in religious studies at the University of Virginia. Sanders hopes other students in the College of Arts and Sciences will take advantage of the wide variety of classes offered by the college’s departments. As a student there he benefited greatly from taking the classes he was interested in, regardless of whether they were beyond the scope of his major.